Directories are one of the most effective ways of tracing members of a family, especially tradesmen, and hence are essential if you're searching your family history or building a family tree. 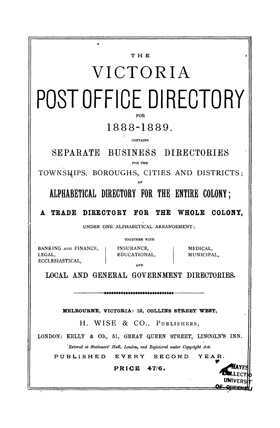 Many small businesses needed to ensure the public was aware of their activity and one of the better ways to do this (in an age before media dominated) was via a directory. The value of directories as a research tool is enhanced when no census material is available. Refer to display advertisements as well, as they often provide names and addresses. "What information can I find in this collection?" Contained in this collection are the Wise directories for 1888, 1904 and 1914.